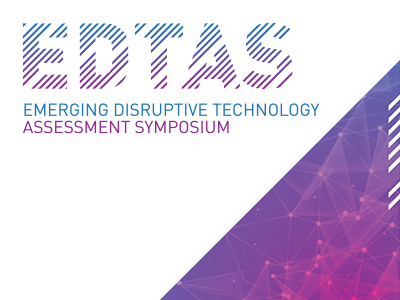 The Emerging Disruptive Technology Assessment Symposium (EDTAS) series is a technology foresighting program under the Next Generation Technologies Fund. It is designed to consider an emerging science and technology topic that will likely have a major impact – transformational or disruptive – for the Defence or National Security domains in the 20+ year timeframe. DST partners with universities and industry to co-host these events, which are typically a mix of leading-edge presentations, thought-provoking workshops and keynote presentations. The topic of the next EDTAS is space technologies. The EDTAS on Space Technologies will be held Tuesday, March 5 and Wednesday, March 6, 2019 in Perth. The symposium will be co-hosted by Curtin University, Edith Cowan University, the University of Western Australia and Murdoch University. Through this symposium, DST is looking to bring together internationally recognised academic, industry and Defence leaders in a multi-disciplinary workshop environment over two days to explore and shape the long-term vision for space technologies. The symposium will explore this expansive field from multiple perspectives in order to understand the application and implications for the national security domain.